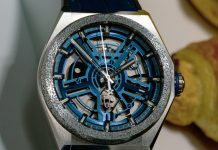 It’s funny really, colour for most watchmakers is treated as this cutting-edge, experimental thing, a strange, avant garde expression of their aesthetic excellence. As far as I’m concerned, it’s all a bit much. When there are watch brands like Farer around, praising the fact that “oh look, it comes in green now” just seems a bit sad. Colour is the hallmark of Farer. Well, that and excellent, affordable pricing of course. Sure, that means plenty of flashes of red and orange highlights, but even when it comes to an everyday blue dial their designers have had their wicked way. One shade of blue? For shame. Have six. The Cobb is that blue-dialled watch. Not only is the greater part of the dial an elegant shade of midnight, but the subdials have their own aqua scales. 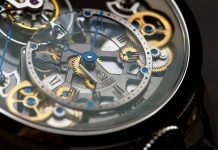 The 30-minute chronograph counter – the ‘big-eye’ of the ‘big-eye dial’ – is like a Dulux paint sample menu, ranging from duck egg to cerulean. In less confident hands it would be a mess; here it’s flawless, with crisp, clean lines in-between. The same can be said about the hands, too. Yellow, red and a nice, burnt orange all on the same dial seems like madness on paper; here though, the Cobb uses the highlights to subtly pick out different bits of information. Those differences make it supremely easy to read, just what you want from a chronograph. Perhaps more importantly for Farer than the colour, however, is the fact that it also happens to be part of their first triumvirate of mechanical chronographs. It’s a big step for the brand but one they’re taking in their stride. The movement inside is an ETA 2894-2 Elaboré grade modular chronograph. It’s a solid chronograph but, more importantly, it’s also surprisingly svelte. The entire movement is just 6.1mm which, with Farer’s equally pared-back case, makes for an elegantly slim 12.5mm. In fact, all the proportions are in keeping with retro sizes; the Cobb measures in at 39mm across. Aesthetically the case is pure Farer: clean, nuanced and perfectly-proportioned. The elongated pushers are lovely to use and despite its diminutive size this leaves enough room to easily read the chronograph counters. It’s all topped off with Farer’s signature bronze crown which, as the metal is wont to do, will develop a patina over time. Personally, I find a full-bronze watch a bit much, so the little flash here is ideal. For a pretty new watch brand, Farer have been knocking their collections out of the park, from their basic three-handers to their seriously cool compressors. 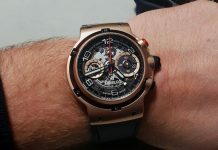 With the mechanical chronographs they are taking that ace batting ability to a new league in both mechanics and design. More importantly, it’s the nicest watch I’d ever spend £1,675 on. Share the post "Hands-On: Farer Cobb Mechanical Chronograph Watch Review"